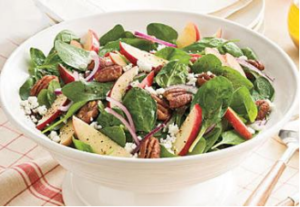 Here’s a fresh salad that gets kids to eat spinach because of its flavor and delicious dressing. in a small bowl whisk together 5 Tbs of olive oil, 3Tbs of vinegar, 2 tsp of salt and black pepper. toast for another 1-2 minutes. Season with salt and pepper and continue with remaining slices.